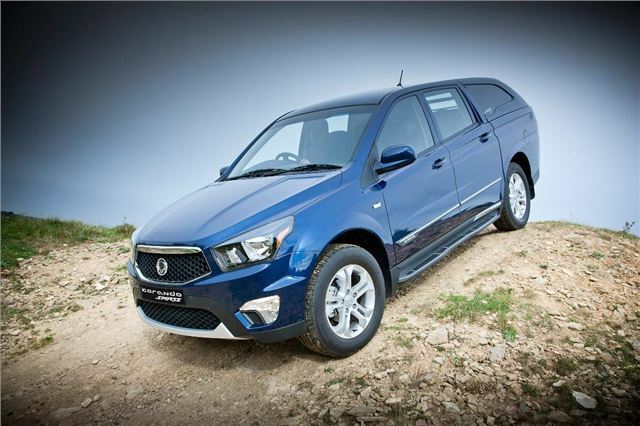 Prices for SsangYong's new Korando Sports pick-up will start at £18,295 (including VAT) and be available in two specifications: SX and EX. The commercial pick-up is said by the company too bring a "new level of refinement to the market place, blending the suspension, engine and cabin finesse of a passenger car, the silhouette, space and seating for five that’s typical of a double cab, and the rugged workmanlike ability of a commercial pick-up." Power comes from a 2.0-litre 155PS e-XDi diesel engine that, when combined with its four-wheel drive system has the capability of towing up to 2.3 tonnes - more than enough for a decent-size trailer or small horsebox. All models have a five-year/unlimited mileage warranty. Mitsubishi recently announced that its L200 would benefit from a five-year warranty, too, but the L200's comes with a 125,000-mile limit. The SX model gets 16-inch alloy wheels, tinted glass, air conditioning, leather covered steering wheel, remote central locking, Kenwood MP3 CD & RDS radio with a USB & auxiliary port and Bluetooth connectivity, while the top-sped EX adds leather upholstery with heated front seats, powered driver’s seat, heated, electrically adjustable and power folding door mirrors and rear parking sensors. A 6 speed automatic transmission with cruise control is also available as an option.